Most industry observers would agree that the acceptance and use of mobile wallets has been less than expected. Alternatively, research shows that digital wallets and P2P are poised for a significant upsurge. According to a recent U.S. Bank Cash Behavior Survey, 47% of consumers surveyed say they prefer the use of digital payment apps versus cash (45%). In addition, a study from Juniper Research found more than half (53%) of global transactions at POS will be contactless within 5 years, compared to just 15% this year. To determine the potential of these payment alternatives and the strategies being used to expand acceptance and use of digital wallets and P2P payments, we conducted research of financial institutions globally. In addition, we looked for additional insights from other sources and industry case studies that would help organizations be better positioned for the future changes in the payment ecosystem. We would like to thank the Fiserv, who sponsored this most recent global research on digital wallets and P2P payments. Their partnership has enabled us to create benchmarking of the expansion of payment solutions in banking and to better understand the impact on the consumer. As more organizations are seeking to provide easy to use wallet and P2P payment apps and improve the customer payment experience, this research provides a roadmap for implementation and for setting key performance indicators (KPIs). 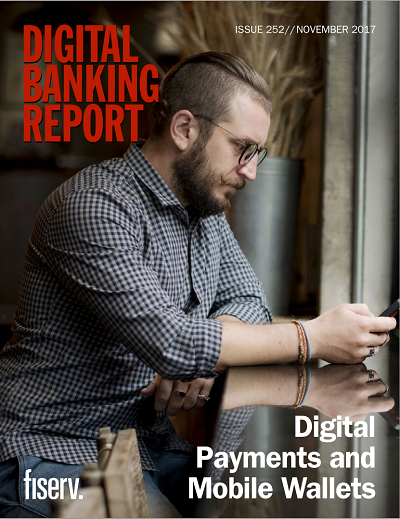 More importantly, we hope that banks and credit unions will use the insight in this report to take action on developing new payment solutions that will resonate in an increasingly crowded marketplace. Research into mobile wallet and P2P payment strategies, opportunities and challenges for financial institutions worldwide. Includes industry influencer interviews and case studies.